How to Stop Post Nasal Drip? : Also referred to as upper airway cough syndrome, post nasal drip is a condition resulting from the nasal mucosa producing excessive mucus. The mucus in your body usually helps fight infections and clear the foreign particles you inhale. However, when the amount of mucus produced is more than actually required, it accumulates in the nasal passage and often drips back, resulting in post nasal drip syndrome. 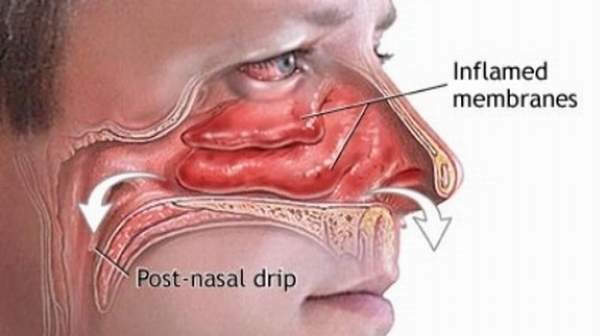 Some of the common causes of post nasal drip are allergies, sinus infection, climate changes, infections that cause flu and cold, a cold temperature, drugs for blood pressure, birth control pills, pregnancy, spicy foods, etc. Some of the signs and symptoms of this condition include nausea, difficulty in swallowing, coughs that worsen at night, soreness in the throat and bad breath. Instead of using medications prescribed by a physician, you can use natural remedies that can effectively stop post nasal drip. Here is a look at some of the best home remedies to stop the uncomfortable and irritating symptoms that come with this condition. ACV is well known for its medicinal properties and is used as an important ingredient in many home remedies for countless of health issues. It is also a superb natural remedy for stopping post nasal drip as it has antimicrobial and anti-inflammatory properties. These properties can effectively help in reducing inflammation in the nasal passage and fight the condition. Add 1 tablespoon of apple cider vinegar to 1 glass of water and stir well. Drink this mixture 2 times every day for best results. If you like, you add a bit of honey for flavor. Used for hundreds of years for its powerful medicinal properties, honey is a great natural treatment for various health issues. It is a superb decongestant and contains anti-inflammatory and antibacterial properties that can help in treating cough and cold. This simple home remedy will stop post nasal drip and make you feel much better in no time at all. Add 1 tablespoon of organic honey to 1 cup of warm water. Repeat 2 to 3 times a day until symptoms of the condition stop. Ginger has antibacterial properties due to a component it contains – gingerol. Apart from this, the herb is also anti-inflammatory and is able to act as a decongestant. All these properties make it an excellent home remedy for naturally treating post nasal drip. Slice 1 to 2 inches of fresh ginger. Steep the ginger pieces in 1 cup of hot water for 5 to 10 minutes. Drink the ginger tea before it gets cold. There is a compound found in garlic known as allicin, which possesses antimicrobial properties. It is commonly used as an effective natural treatment for cough and cold, which are some of the most common causes of post nasal drip syndrome. If you suffer from this condition, garlic is surely one of the best natural remedies you can try. Crush 3 to 4 cloves of garlic and extract the juice. Mix a small amount of honey with the extract. If you prefer not to use any honey, the remedy will still be effective. Consume this mixture at least 3 times daily for excellent results. Apart from being antimicrobial, coconut oil has anti-inflammatory properties that can effectively help in treating upper respiratory tract infections such as post nasal drip. This is because coconut oil has many medicinal properties that make it great for naturally treating a number of health problems, from digestive issues to skin conditions. If you are looking for a simple yet effective natural remedy to stop post nasal drip, resort to coconut oil. Consume 1 to 2 teaspoons of organic coconut oil every morning on an empty stomach. Repeat every day until you notice the symptoms of post nasal drip going away. Considered to be a very good natural decongestant, turmeric is commonly used to treat cough and cold, owing to its anti-inflammatory and antibacterial properties. If you have tried other home remedies to get rid of post nasal drip without success, then it is high time you gave turmeric a try as it is known to be highly effective in treating this condition. Mix 1 teaspoon of turmeric powder in 1 glass of hot milk. Drink the mixture once every day. Oil pulling is known to have an array of health benefits, including effectively helping to stop post nasal drip. It works as a detoxifying treatment that can decongest your throat. The anti-inflammatory and antimicrobial properties in the oil of your choice for swishing will help naturally stop your post nasal drip. Take 1 tablespoon of olive, coconut or sesame oil and add a few drops of 3% hydrogen peroxide. You can also leave out the hydrogen peroxide if you prefer. Swish the mixture in your mouth on an empty stomach for 10 to 15 minutes. Spit it out and then rinse your mouth thoroughly. Do this once daily until your post nasal drip stops. Although mostly famous for possessing antimicrobial properties, grapefruit seed extract is also known to be effective in reducing inflammation. Due to its antimicrobial and anti-inflammatory properties, it is a highly effective natural remedy for combating inflammation and infections that are associated with post nasal drip. All you need is 200 mg of grapefruit seed extract supplement. Consume the supplement 2 times a day. You will notice relief from the symptoms of the condition in a short period of time. The symptoms of post nasal drip can be uncomfortable and irritating, making it imperative that you stop the condition as soon as possible. The good news is that there are great natural remedies that work very well to stop post nasal drip and providing relief from its many symptoms. These remedies are simple, inexpensive and best of all, highly effective.